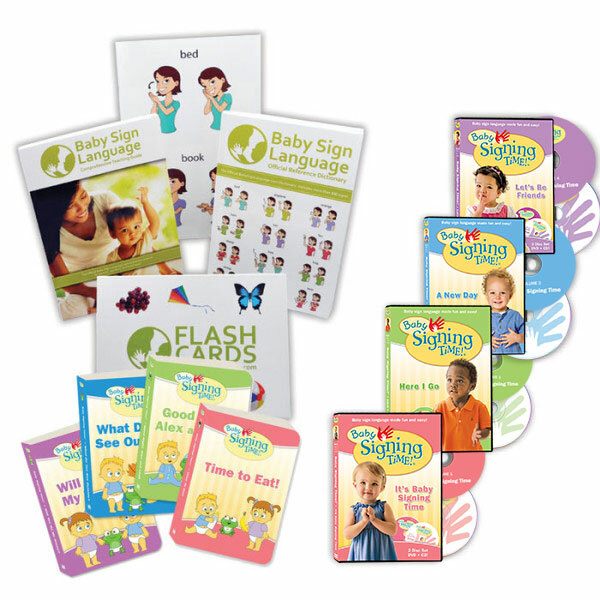 Once baby learns his or her first few signs, start adding a few more signs, and then when those are learned, add a few more. The first ten or so signs will come very gradually, but the rate of learning will accelerate after the first few months. Baby will soon become more proficient at signing and will even start prompting you for new signs. Follow your child’s interests when adding new signs, taking advantage of their natural curiosity about their world. Adding signs gradually makes it easier for baby to learn. And while we add new signs, we still want to keep giving the old signs a workout to keep baby from forgetting those old signs. Observe what kinds of signs are most interesting to baby, and focus most of your vocabulary expansion on these topics. For example, if your baby is fascinated by food signs, make most of your new signs about types of food. Particularly at this early stage, it is much more important to get momentum and keep it fun than it is to learn any particular signs. Just like when a child is learning to read, you just want them to read, and shouldn’t be too concerned about what they are reading. There will be plenty of time later to balance out their vocabulary and start following their interests. It is easiest to teach new signs in groups of related concepts. For example animals, foods, vehicles, people, colors, etc. Selecting a theme that interests your child, and then add new signs to that group. The contrast between the items in the group help baby understand the meaning of the word. For example, teaching hot and cold together is easier than teaching the signs separately because the meanings of the two words are related and understanding one illuminates the other. Numbers and letters are also good themes, but are too abstract for the early stages of baby sign language and should be saved for more advanced toddlers. Once baby gets more advanced, you will start learning words that you don’t have a lot of exposure to in real life. To facilitate the learning of these words, you can start using teaching aids to help you. 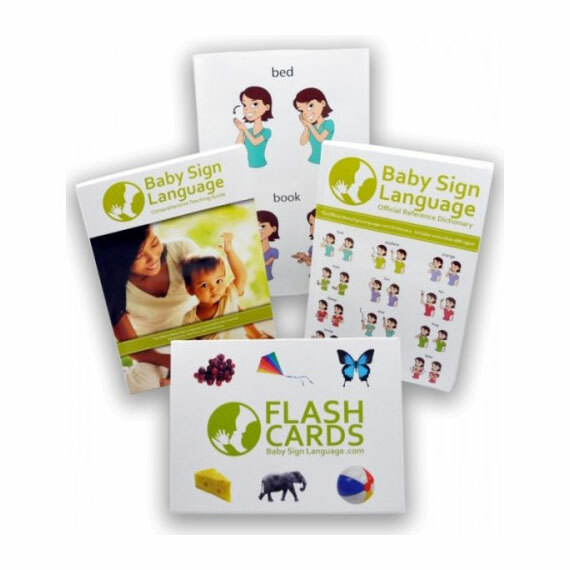 Flash Cards – print out some of our baby sign language flash cards to add groups of signs, such as animals or colors. Picture Books – sign along to your baby’s favorite board books. Very simple books where each page has a clear theme that can be signed are best. For example Eric Carle’s Brown Bear has one animal on each page of the book. Props – figurines are another great way to teach signs. Figurines representing different animals, vehicles, or people are common choices. For small children, select figurines that are small enough for them to hold, but big enough so that they are not at risk of being swallowed. 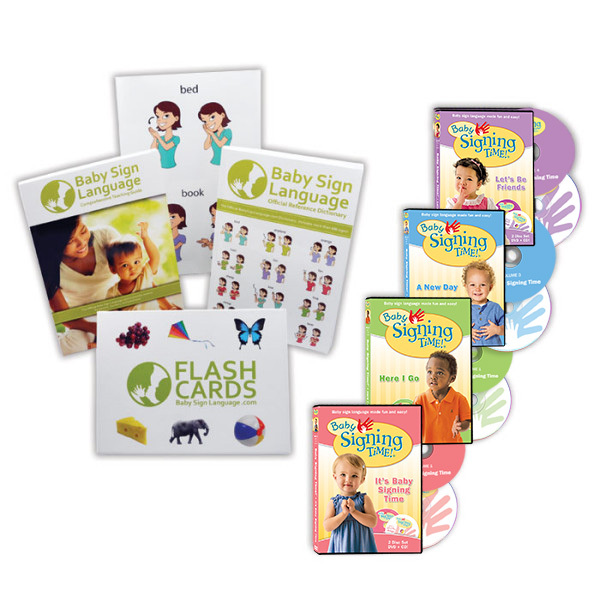 Our award-winning Baby Sign Language Kit gets your baby signing faster. My daughter is 7 months old and I have been using about 7 consistent and relevant signs with her for a couple of months. You say to add new signs once the baby has mastered the basic set. Since she is not yet signing back, how do I know when she has “mastered” the ones I’ve been using? She seems interested when I use them but I don’t know if she’s, for example, looking at daddy because I’m saying it at the same time, or if she’s familiar with what the sign means. Mastering is defined as the ability to use the sign contextually. Once she signs daddy when daddy is around you can mark that sign as mastered. Similarly when she asks for milk when she is hungry you have achieved the learning objective. My daughter is 17 months old and knows about 40-50 signs. She had moderate hearing loss that was recently corrected by ear tubes. So she only has five or six words and communicates mostly through sign, though her verbal communication should pick up soon. She loves the Signing Time videos and has been watching them since she was tiny which is how we’ve both learned signs. Should she know more signs than that by now? Do toddlers tend to show less interest in signing once they learn to speak? Thank you! We humans always take the path of least resistance. As your baby becomes verbal she will rely more in the spoken words than signs. 40 to 50 signs is incredibly high in terms of concept comprehension and communication. Most kiddos know and say only about two to three words by this age. I would encourage you to continue teaching her signs as well as words in order to promote expressive language. Hi! My son is almost 18 months old. We’ve been working on signing for a while now, but he’s only caught onto 3: all done, more, and wash hands. What would you guys recommend I do? He hasn’t started talking yet, but knows what is being said to him. I want him to be able to sign so he can communicate, and we can reduce the amounts of tantrums. What should I do next? I’ve been trying to sign car, water, ball…things that interest him, but he’s not catching on. Help is appreciated! One thing that worked for us was signing in the context of songs and rhymes. We used the Baby Signing Time collection that comes with the Premium kit. My son is 13 months old and he knows 8 signs. I’m excited to teach him more signs, especially since he appears to be understanding and communicating more and learning faster and with more ease. How many new signs do you recommend teaching at a time? Hi Erin, we generally try to practice all the signs baby has already mastered as we introduce 3 to 5 new signs. What is the sign for “upset tummy” ? Thank you so much that I can learn how to sign to my little boy. Sometimes, its difficult to try and understand what my son wants or needs when he can’t talk yet; ( 1 years old). It seems it has been working with the sign language. Thank you!! I would use the word hurt, and make the sign over the body part that is hurting to communicate where you are feeling sick (so here, sign hurt over your tummy). You can also use the sign for sick. Hi, I was wondering how you sign names of people, like our child’s name. He doesn’t need to know ours, we are mum and dad etc. but what do we use to sign for him? Usually names are finger spelled, but for young children this is too difficult, so we make up a sign for their name. You can also use something generic like baby or sunshine. My son is 10 weeks old and I have been working on the milk sign for a week now and he is already making the making the “milk” sign with his hands when I do it, I am sure he is just copying me at this point and not realizing what I am doing at this point but I am sure that it wont be long that with me showing him his bottle and doing the “milk” sign and repeating the work milk to him everytime I offer him his bottle he will associate the two soon and realize what he and I are both doing. I am hoping that within a few weeks I will be able to incorporate a new sign like “all done” or “more” and have the basic signs down by 6 months or so. Great to hear that he is starting to recognize and imitate signs, those are the first two steps. Keep us posted on how it goes! Hi, I’d love to order your baby sign kit but am based in the uk. Do you ship internationally? Hi All, I came across this web site while searching for an efficient and enjoyable method to teach English to young Italian children aged 1 to 3. I am Italian and would love to help young toddlers to get closer to English. Do you think it would be a good way for them to learn basic words and enjoy the new language, although practicing only at school? We have lots of bilingual families tell us that baby sign language helps them bridge between the two languages, because you have a common sign for the words irrespective of the language. I just don’t understand. If they are able to sign a word at 9 or 10 months old, why cant they just make a sound, even it’s a simple sound to SAY what they want? Talking seems simple, because most of us adults have been doing it for decades. But, it is actually quite a complex feat of coordination involving breath control, control of the vocal chords, control of the tongue, etc. For most babies, this kind of fine motor control is beyond their grasp, and it will take them at least 18 months before they have a significant vocabulary. In contrast, signs are a lot simpler from because they mainly involve gross motor skills. In the same way that most children can crawl and walk before they can talk, most children can sign much earlier than they can talk. I saw your post about signing to your little one and just wanted to encourage you as well. I also started signing to my little guy at about 4-6 mos and continued for several months although he never reciprocated. I eventually just stopped because I assumed he wasn’t going to pick it up. About a month ago I was feeding him snacks and randomly decided to show him the sign for “more” in an attempt to keep him from yelling when he wants more. Two days later I was feeding him snacks once again when he started yelling/grunting indicating he wanted more. I had once again forgot all about signing and simply asked him if he wanted more. To my surprise he looked at me, smiled and started doing the sign for “more”. I couldn’t believe it! I had spent so many months trying to get him to sign and now in 2 days time he picked it up just like that! He is now 14 months old and that was about 3 weeks ago. Since then he has also learned “please”, “thank you”, “eat”, “finished”, “milk” and he uses them all regularly. I am truly amazed at how quickly they pick it up! Don’t give up! I’ve been using basic signs with my baby since he was about 6mo and he is now 9mo and still isn’t even trying to use signs. I’m hoping he’ll start soon. Sometimes it can just take a little longer for it to click. One thing worth watching for is whether baby watches your hands when you sign. If so, he is on the right track. After that you want to watch really carefully for anything that could be signing. Sometimes the early signs are very rudimentary. You will be glad you stuck with it – when it rains it pours! I have been doing a couple of signs with my baby for the past two months (“all done” and “more”) He is 9 months old and has just started using the signs at the table within the last 2 weeks–he is very proud of himself! I am wanting to add more signs but I just want to make sure that i understand correctly. Do I add a couple new ones and once he is using them, then add a few more? Thanks. Your website is very helpful. I just stumbled across it the other day. Exactly! Once your baby shows understanding of a couple of signs you introduce new ones while continuing to reinforce the first signs he learned.